Icarus could fly because his father, the master sculptor of Athens, Daedalus, had closely observed the motion of birds and fashioned wings from wax and feathers. The wings and the flight were yet another manifestation of what ancient Greeks always did in both myth and art: imitating natural phenomena. Plato explained this in The Republic when he said that all art is juvenile burlesque that greedily feeds upon nature. Going by the Platonic theory, the flight of Icarus was a mere representation, not an actual occurrence (much like Belgian surrealist artist Rene Magritte’s representation of a pipe in The Treachery of Images). Abdul Jabbar Gull’s imagination seems to have been captivated by a representation of another kind — of the celestial through the physical. The proficient yet lonesome occupant of Pakistan’s meagre sculptural landscape recently displayed his latest collection in a show titled Thoughts From The Celestial Realm. As if the name is not a dead giveaway, the central ethos of the exhibition pertains to Gull’s ruminations on man’s relentless, oft ruinous, hunt for a pre-ordained purpose and a divine order. The celestial motifs in his sculpture have pervaded his oeuvre for the past two decades and hearken back to their other popular depictions — from Michelangelo’s Creation of Adam to Hieronymus Bosch’s haunting Ascent of the Blessed. Though Gull’s artistic reverie seems to follow a well-trodden path, the modes through which it manifests itself have largely remained neglected in Pakistan — and not just because of local factors. Sculptors of the 20th century squirmed at, reluctantly chewed up and subsequently spat out the formalistic traditions they had bequeathed from their predecessors. The Frenchman Auguste Rodin (1840-1917) led the initial onslaught with his naturalistic and emotionally poignant sculptures which reverberated like a blood-curdling scream in the quiet night of the Baroque period that preceded him. Today, the likes of British-Indian sculptor Anish Kapoor and Colombian figurative artist Fernando Botero continue to lead the same charge against traditional sculpture that dominated Europe between the 16th and 19th centuries. What about us — in Pakistan? In what milieu are the sculptures of this land rooted? Perhaps mystical Hindu spirits hold the key. 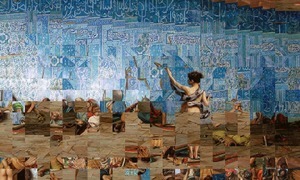 Or so the eminent Pakistani art critic Dr Akbar Naqvi would have us believe. His love affair with art began at the age of 12 when his father took him to see an iron sculpture of Yakshis – spirits that symbolise fertility in Hindu mythology – at the Patna Museum. Enraptured, Naqvi dove head first into this new-found world and always maintained thereafter that Pakistan’s artistic heritage stretched back far beyond 1947. Despite this rich inheritance, few Pakistani artists have ventured into the rocky terrain of sculpture. Even fewer have left a mark. Perhaps the reluctance stems from the residue of Abraham’s rage-filled decimation of idols in Babylonia. But then, again, this country has no shortage of false idols. 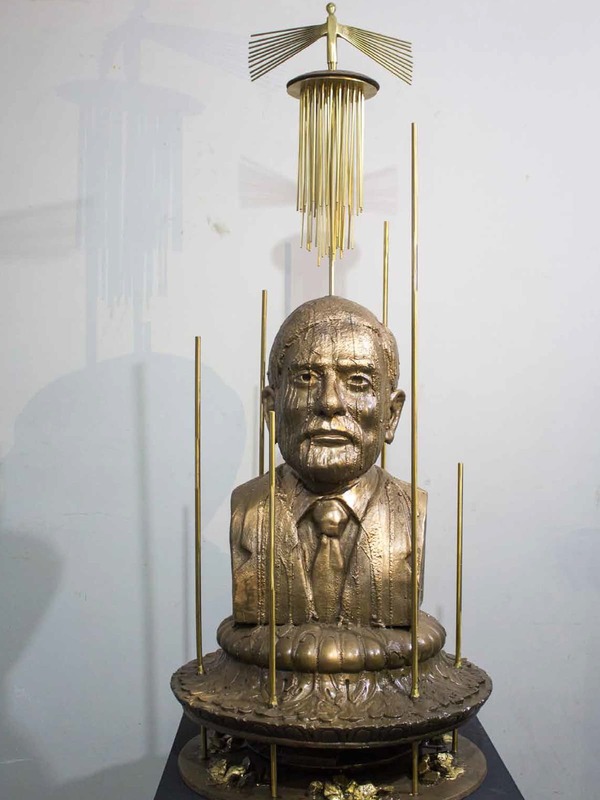 The early champion of sculpture in Pakistan was Syed Afsar Madad Naqvi who worked through the middle and the late 20th century, sculpting figures which incorporated classical Indian artistic forms and traditions. But he is oft eclipsed by Shahid Sajjad who, in 1965, went to live in the tribal village of Rangamati inside the Chittagong Hill Tracts (which, at the time, was a part of East Pakistan) and later established himself as a pioneering force in a Pakistani art scene bereft of state patronage. He worked primarily with wood and bronze, quickly cementing his status as a master sculptor despite never having received any formal training. Today’s sculpture scene is dominated by the likes of Amin Gulgee, who primarily relies on elemental and abstract forms; Anjum Ayaz, whose public installations along Karachi’s beachfront, Seaview, appear to recall the primitive innocence which underpinned the work of Romanian sculptor Constantin Brancusi; and Adeela Suleman who trots behind French-American painter Marcel Duchamp’s maxim that everyday ‘found objects’ can collectively serve as sculptures. Admittedly, Gull figures pretty high in this rather short catalogue of contemporary Pakistani sculptors. Armed with an artistic sensibility forged in the metal workshops of Mirpurkhas and refined at the National College of Arts, Lahore, he has worked with various forms and materials but the burning question at the heart of his work remains unaltered: how to grapple with the mysteries of the universe through figurative representations. For him, “The human form is the most important phenomenon of the Universe.” Gull’s early work relied on a predominant usage of wood. He often incorporated the natural texture of the sheesham tree into his sculptures in an attempt to create a symbiosis between the material and the art it embodied. Plato would approve. However, after a brief stint in South Africa, Gull’s figures morphed into the looping aesthetics of English artist Henry Moore’s languid public sculptures. Some of Gull’s previous work shows a multitude of column-like figurines with flattened faces encircling a cube. Although the symbolic through-line that has governed Gull’s art over the years remains unwavering, lately he has been hard at work trying to fashion a new visual sensibility. Centred upon his notion of ‘ordinary souls’, his latest exhibit endeavours to “express common sufferings, grief, and relationships at both an individual and collective level”. 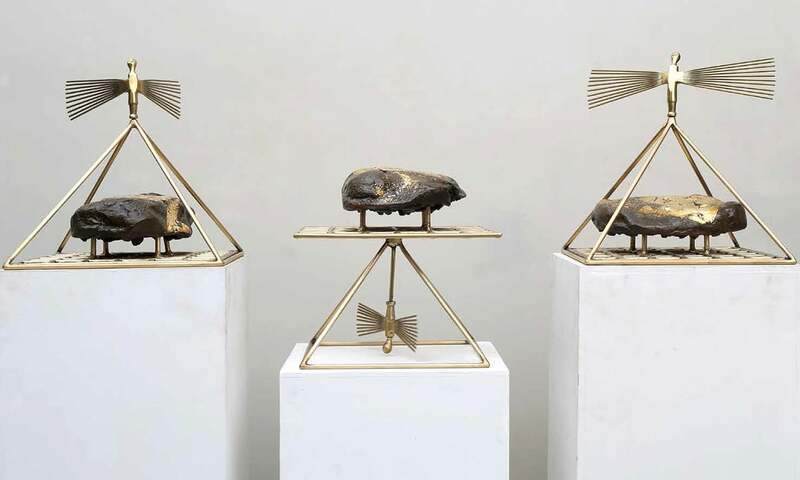 Through a fusion of brass, resin and gold leaf, his new pieces have catapulted Gull to the pinnacle of his expression. His greatest feat here lies in capturing and giving a face to those fleeting bursts of thought which drift through the unknowable depths of mind. Gull has encased these thoughts in metal. Each of his sculptures is centred upon his little gilded winged creatures which spring from faceless heads and swoop downwards from the ceiling or sprout upwards like weeds, each fluttering creature resolutely independent and yet informing the one next to it. Gull’s ethereal brass elves cavort, dance and buzz about, completing this physical manifestation of our illusory thoughts. The most arresting of these pieces looks like an inverted pyramid and thematically resembles the famous glass skylight at the Louvre; though formalistically, it appears more like fractured shards of light, adorned with little angels caught mid-flight. “I have no conclusions, so my work speaks of mysteries and ambiguities,” says Gull, maintaining the evasive nature of his artistic philosophy. Be that as it may, Gull’s winged creatures, in their quest to discover the celestial realm, appear to mimic the flight of Icarus who, against the advice of his father, flew too close to the sun. This melted the wax in his wings and sent him plummeting to his death in the sea. Perhaps the lesson here is that the celestial realm does not want visitors. Maybe its door is clamped shut. But that does not stop Gull from knocking — and this nation’s art is all the richer for that. This article was published in the Herald's February 2019 issue. To read more subscribe to the Herald in print. Has performance art come out of the fringes and become mainstream?